You don’t need government permission to bear arms! 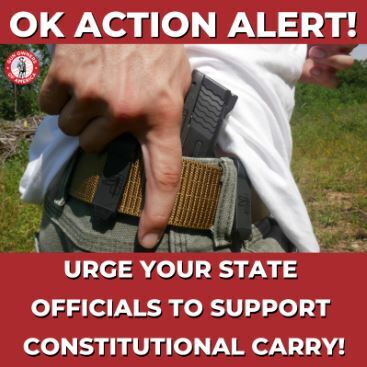 Click on the Take Action button to urge your state lawmakers and Governor Kevin Stitt to support Constitutional Carry! The constitutional whirlwind which has swept across America may soon be blowing through the Oklahoma prairie. The bill — House Bill 2597 — is sponsored by Representatives Echols, Mize, Crosswhite, Hader, Townley, McDugle, Sean Robers, Olsen, Gann, Kevin West, and Steagall. It tweaks a few provisions of law, but, at its core, it’s simple: The bill would legalize concealed carry, open carry, and “vehicle carry” without a permit for honest citizens 21 and over (and servicemen and veterans 18 and over). It would allow you to get an optional permit for purposes of reciprocity and Brady Check exemption — but would not require it in the Sooner State. The reason that “Constitutional Carry” has been so popular is obvious: You should not be required to get the government’s permission to exercise your constitutional right to defend yourself, your family, your friends, your community, and our Constitution. States which have adopted “Constitutional Carry” such as New Hampshire, North Dakota, and Maine are the safest states in the country. Contrary to dire predictions that states would become “the Wild West,” places like Arizona found that violent crime went down sufficiently after they allowed law-abiding citizens to protect themselves in this way. But, as in other states, this extraordinary victory won’t just fall into our laps. It will take the efforts of all of gun owners across Oklahoma to push House Bill 2597 through the Oklahoma House and Senate and onto the governor’s desk — and to secure the governor’s signature. 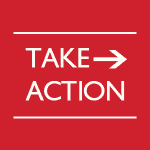 So please take action and urge your elected officials to support HB 2597! P.S. Please email your state lawmakers and Gov. Stitt to support Constitutional Carry. And if you’ve let your membership lapse, make sure to renew your membership in Gun Owners of America today for only $20!